Yesterday, my mailman brought a sweet surprise. My prize from Gina, for winning her birthday drawing on her blog. 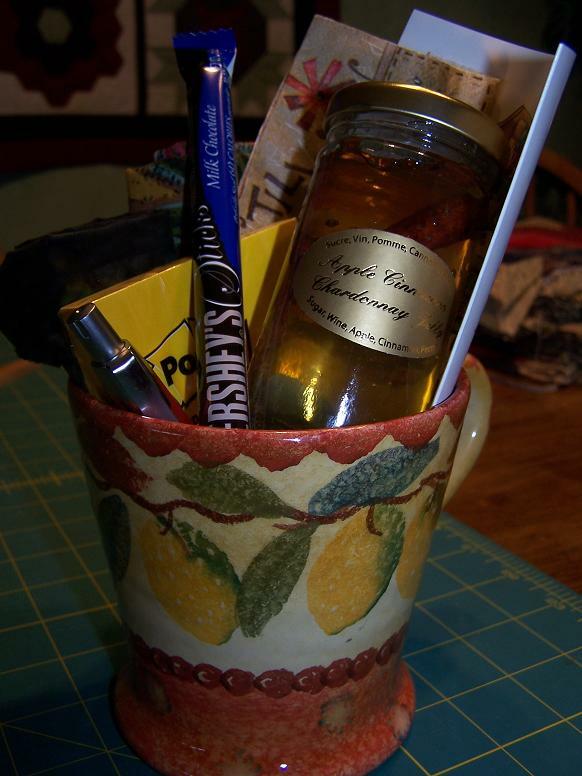 She had all kinds of goodies packed into this adorable coffee cup, including fabric & chocolate. There is also some yummy Apple Cinnamon Chardonnay jelly. I need a little smilie face licking it’s lips to insert here. (WordPress really needs to improve the smilies and ease of use. How hard could that be?) Anyway, I digress…Thank you Gina! Lulu still seems to be doing better, but I think I will call the vet to see if it’s too soon for her to have another allergy shot this week, and maybe just have him look in her ears again to make sure the antibiotics did all the good in there. We watched The Illusionist last night. I give it two thumbs up! One of the better movies I’ve seen lately. I am glad Lulu is feeling better! And that you are feeling good enough to quilt today!!! Yipppeeee!! Hope the inversion table helps you as much as it has helped us!!!! Glad you are both feeling a little better. And good for the quilt progress! Getting things done always helps my mood! what a fun prize to get in the mail! glad you’re feeling a bit better. Glad that Lulu seems to be doing better and that you are back to your quilting (you do beautiful work!). I’m eager to hear how the inversion table works for you as I’ve been thinking about buying one but hadn’t talked to anyone who does use one (glad to read that Jan & hubby have used/liked one–I didn’t know that until reading it here). Hope the pain eases soon. Sorry you are feeling crummy. Hope everything improves soon.